Pierre Champenois of Nantes, who was 87 years of age in May of 2005, gave me a copy of this book while we stayed with his son Pierre-Antoine in Nantes prior to our going to the CHAMPENOIS reunion at the Chateau de Vair. 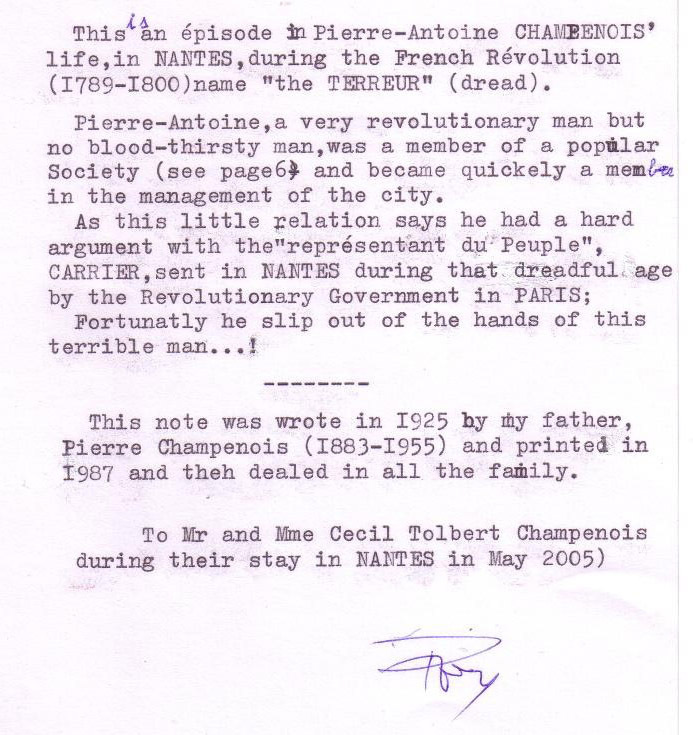 Pierre placed the above note on the inside cover of the book about his direct ancestor, Pierre-Antoine Champenois, 1766-1832, who was a resident of Nantes. Pierre-Antoine Champenois was a hero in Nantes during the French Revolution. This is an episode in Pierre-Antoine Champenois' life, in Nantes, during the French Revolution (1789-1800). Name, The TERROR (Dread). Pierre-Antoine was a very revolutionary man, but not a bloodthirsty man; he was a member of the popular Society (See page 6) and became quickly a member in the management of the city. As this little relation says, he had a terrible argument with the "Representant du Peuple" [Representative of the People], [named} CARRIER, sent to NANTES during that dreadful age by the Revolutionary Government in PARIS. Fortunately, he slipped out of the hands of this terrible man! This note was written in 1925 by my father, Pierre Champenois (1883-1955), printed in 1987, and then given to all the family. To Mr., and Mrs. Cecil Tolbert Champenois [Jr.] during their stay in NANTES in May 2005.